While I was at the LCS recently, I found some boxes of rookie cards from the early 2000s that I searched in order to find some guys who signed TTM. 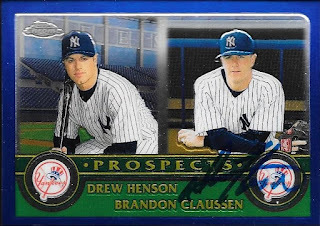 One of those was former Yankee, Drew Henson. I found several nice cards, and they turned out really well when I got them signed. I liked the 2002 Bowman. It was the thicker version, but the card was damaged when it got back to me. Probably from when the envelope was processed at USPS. Henson (b. 1980) played in the majors in 2002 and 2003 for the Yankees. He had 1 hit, no home runs and a .111 batting average. He was also a quarterback for the Dallas Cowboys in 2002 and also the Lions in 2008. He played in 9 games (1 start) and threw for 98 yards and one touchdown. I mailed to Henson on January 7 and got the cards back on January 19, for a 12-day TAT.